I am now directing one and all to take the time to check out the FREE HUGS CAMPAIGN video whereby you can expect to feel that swell within your very soul. This is the real life controversial story of Juan Mann. His sole mission was to reach out and hug a stranger in order to brighten up their life. In this cited video, Juan reminds me of John Lennon. 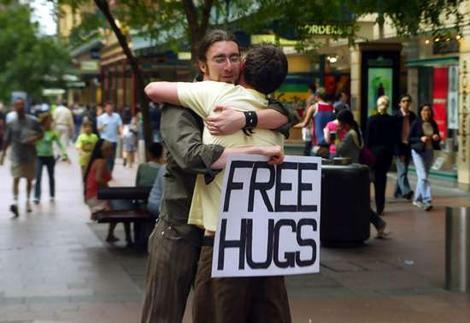 In this age of social dis-connectivity and lack of human contact, the effects of the FREE HUGS CAMPAIGN were phenomenal. As this symbol of human hope began to spread across the city, police and officials ordered the FREE HUGS CAMPAIGN banned. What we then witness is the true spirit of humanity coming together in what can only be described as awe inspiring. For additional information, one can also take the time to visit the official home of the FREE HUGS CAMPAIGN.